Walk on glass, fixed or moving elements, with framed or frameless appearance. 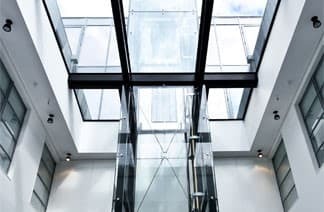 Glass rooflights bring natural light and an enhanced feeling of space connecting internal spaces to their surroundings. Our rooflights will enhance your interior and exterior spaces. Find a skylight or walk on glass roof lights that’s perfect for your residential or commercial design project – in London, or anywhere else in the UK. Rooflights fill the space below them with lots of natural light, immediately connecting the rooms in your home or office premises. Our walk on glass roof lights are structurally strong and will add both practical and visual value to your project. Rooflights optimise light penetration to deliver environments that are bright, functional and connected to the wider area of the structure in which they are situated. Suitable for application for both commercial and residential projects, rooflights create a better sense of room and convert seldom-used spaces into areas that have a purpose. Equally popular with homeowners and businesses, roof windows are used to add value to refurbishment and design projects throughout London and UK-wide. The enduring quality of our skylight range – which can be tailored to your requirements – means we can respond to your creative venture in full, no matter how complex it might be. Rooflights can be installed into flat roofs, used as part of an orangery design, or to fulfil a range of other applications. More generally, they enhance the thermal performance of the area above which they are sited, improve ventilation, and create outstanding sightlines – from the outside and inside. Contact us to arrange a meeting or to get a quote. Rooflights – also referred to as roof windows or skylights – provide more than aesthetic value. By optimising light entry, they reduce reliance on internal heating systems and subsequently drive down energy consumption levels. This translates into lower running costs and a noticeably reduced carbon footprint. Financially and environmentally, rooflights make perfect sense. They also convert residential or business environments into spaces that can be used throughout the year. Even during winter, your walk on glass roof lights will help you make the most of the limited daylight hours available. Contact us for further details. A brighter environment has a positive effect on mood. Homeowners will be able to lie down in their new room or extension and enjoy almost unbroken views of the sky. Business owners will be able to introduce their customers to a positive space that feels spacious and puts them in a positive frame of mind. If you live in a built-up area of London – or any other densely-populated area in the UK – you’ll appreciate the importance of privacy. When relaxing at home, you want to do so without being overlooked. Rooflights respond to this growing issue by letting in lots of light, while also providing you with the seclusion you need. Your environment will be further enhanced by the ventilation capacity of your roof windows. A space that’s inadequately ventilated will suffer from the build-up of condensation, which could lead to the development of mould if left untreated. Our walk on glass roof lights will keep any home in London or the UK the perfect temperature 24/7. The overall effect of your new skylight will be a space that is perfectly balanced. The combination of optimal light entry and seclusion created by your new installation will reward you with a room that’s perfect for all seasons – whether you’re a commercial or residential customer. Contact our team for a free roof windows quote. Rooflights have the flexibility of design to respond to most design requirements. They can be installed on flat roof systems and are often used by homeowners in London (and UK-wide) to add that vital final touch to their orangery or extension. The walk-on rooflights we install can create both contemporary or traditional effects. Robust, visually and practically outstanding, they will complete your home improvement or business refurbishment project – thanks to our tailored approach. Find out how rooflights can add aesthetic and practical value to your project. From the moment you call us, we’ll work closely with you to understand your requirement in fine detail. Your skylight will be installed to your precise specifications – meaning it’ll look and perform the way you expected it to. If you own a property or business in London, or anywhere else in the UK, contact the Finepoint Glass team on 01923 229949 or use our booking system to arrange an appointment. We will be able to answer any technical questions you have and quote on any of our products, including roof lights.